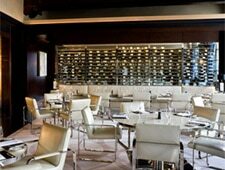 Downtown hotel restaurant spotlights wine and seasonal contemporary French American cuisine. : Adour offers contemporary French American cuisine at The St. Regis Washington, D.C. Executive chef Julien Jouhannaud’s seasonal menu draws from local and regional producers for dishes such as artisanal pasta, Loch Duart salmon “surf & turf” with seared foie gras, and the rack of Colorado lamb and petit farcis niçois. Desserts may include a cherry tart with pistachio ice cream. Wine is a focus at this David Rockwell-designed restaurant, and wine director Ramon Narvaez selects wines with seasonality and diversity in mind.